MIAMI – As his superstars stayed back in the losing locker room, Erik Spoelstra made an unprompted, revealing plea on the stage. No one had led him with a question, but the coach of these Miami Heat delivered an unmistakable message to LeBron James. Here was the disciple of Pat Riley, flinching, covering up, expecting the worst of the world, and proclaiming his concern about the ability of his fragile stars to construct a wall between them and the doubt that dooms seasons. "Our focus is to fight any kind of noise from the outside, or any human condition," Spoelstra said late on Tuesday night. The human condition is this: He's begging his Heat stars to do something they didn't do a year ago, when they lost a series lead, lost the momentum, lost the edge and lost their way going into a Game 6. Please, please, don't collapse under the weight of our frailties again. Spoelstra knows his superstar, his leader, and made an appeal that counterpart Doc Rivers wouldn't need to do with Kevin Garnett, Paul Pierce and Rajon Rondo still playing in their 40s. Fight the human condition? As defensive concession speeches go, Spoelstra hit all the code words for his own apprehension over the gathering storm of a Heat Armageddon. He had to know that he possibly coached his final game at AmericanAirlines Arena with this startling 94-90 Game 5 loss, that losing in the conference finals would leave him with nothing but a notebook of cool Doc Rivers plays to bring with him to Charlotte. "I never thought we would be in this situation," Dwyane Wade said. That's the problem for the Heat, and a year after they collapsed in the NBA Finals it's a mindset that still hangs over them. He was talking about going down 3-2 to the Boston Celtics in the Eastern Conference finals, but this was a reflection of something bigger. All along, they believed this would be easy, that the NBA would lay down for them. Two years ago, they believed this resembled Team USA, that most of the league would crumble like Angola to them. Now, they lose a Game 5 to the Celtics, a team they've had every chance to discard, and here's how LeBron James talks about one more playoff night, when the Heat couldn't match the Celtics' resolve, execution and championship character. "We played good enough to give ourselves a chance to win," James said. "That's all you can ask for." In what universe is that all the NBA's three-time Most Valuable Player can ask for? To play well enough for a chance to win? There's no way James believes that because his talent is too great – too historic – to sound so resigned to this fate. The Heat need to understand that this is unacceptable, that the sloppy play, the turnovers, the abject failure to run a play, to spare themselves breakdowns, eats away to his core. As a Cleveland Cavalier two years ago, James was a mess upon his arrival in Boston for Game 6 of the Eastern Conference semifinals. He had completely tanked Game 5. His disposition, his determination, has been exemplary in these playoffs. His game has been largely efficient, and almost always spectacular. Yet, he's had moments in the fourth quarter where he could've made plays, made shots, that would've crushed these Celtics. And it hasn't happened. This is a contrarian basketball culture that will make excuses for him: From Spoelstra to the complementary players, from Wade to Chris Bosh. James deemed them championship-worthy, cast his lot here, and he's responsible for the results. The MVP gets the glory and he gets the blame. Miami is good enough to beat Boston, and anything short of victory is a failure for the ages. "At this point, it's not about schemes," Wade said. "It's not about play-calling." Which is good news for the Heat, considering Rivers has reminded everyone why, along with Gregg Popovich, he's one of the NBA's two best coaches. 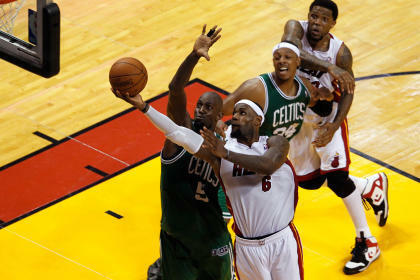 When he disguised his man-to-man as a zone in the fourth quarter, the Heat were lost, and the Celtics had a chance to make that relentless comeback full of Rondo loose ball tips for assists, Mickael Pietrus 3-pointers, Kevin Garnett rebounds and a Paul Pierce 3-pointer over the out-stretched arms of James in the final minute. People wanted to make a big deal out of James and Wade refusing to go to the interview podium in a loss when they never miss the chance in victory. At this point, who cares anymore? The only relevance to James' words in the locker room is the absence of malice over losing, the sense that a Game 5 loss when Rajon Rondo, Paul Pierce and Ray Allen missed 32 of 43 shots is somehow palatable. Hey, we were close. We had our chances. What else can you ask for? The superstar doesn't ask for anything else: he demands it. Of himself, of others. Down 3-2 on the way back to Boston, losers of 15 of their past 16 games at the Garden, Miami should still be the favorite in this series. After all, they have Bosh back now, and he played well in his 14 minutes. 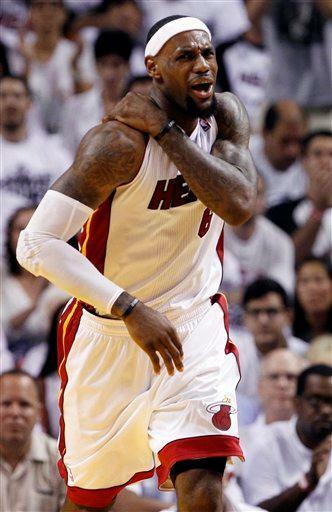 He'll play a bigger part on Thursday night, and this ought to be liberating for the Heat. Full-strength, full speed to a comeback victory in the Eastern Conference finals. They were constructed to win these games, these series, but the leadership won't come out of the protégé spitting out the endless stream of Riley-isms out of the old man's crises manual. "It's probably like a boxer," Spoelstra said. "You just got to go back to your corner right now. We all just have to huddle up and lean on each other. We're the only people we can depend on right now. That can be a very powerful thing." And on and on Spoelstra droned Tuesday night, the wrong voice trying to send the proper message of solidarity and belief. Spoelstra can't counter Rivers on a tactical level, but he does know the psyche of his team, and he rushed quickly in the aftermath of this debacle to throw a blanket over his players to protect them from the harsh cold coming in the next 48 hours. The Heat don't need pep talks out of Spoelstra, but a game plan for victory. Mostly, they need James to declare his greatness and deliver to the magnitude of the moment. For his own sake, his own peace, he has to rage against that Celtics monolith, those banners, his own gory Garden history, and get these Eastern Conference finals back to the shores of Biscayne Bay for a Game 7 on Saturday night. Two years ago, he had gone to Boston for a Game 6, and the excuses for losing surrounded him everywhere. From Mike Brown to his Cavaliers supporting cast, from Kevin Garnett to Paul Pierce, circumstances declared James free of responsibility for that loss. Not this time, not this team. James can't let these Heat go down in the conference finals because no longer is it good enough for the Heat to simply give themselves a chance to win, to declare the Celtics great, proud champions and say, hey, there's no shame in losing to them. The shame will be downright debilitating, and there has to be a part of James that will rage against that possibility now. Wade insisted he never imagined that the Heat would be in this predicament, but here they are, Game 6 again, stumbling, reeling and fighting to hold everything together. When the coach could've proclaimed his unwavering confidence in these Heat, the first words out of his mouth reflected his keen understanding of history. "We normally respond really well to desperation," Wade said. Desperation is the cusp of elimination, and Miami couldn't have possibly reacted worse to it a season ago in the Finals. Now, the Heat get to show the progress they've made, the maturity, the poise, the championship DNA that exists somewhere within them. Now, the Miami Heat get to reveal themselves in the purest, truest way on Thursday night at Boston Garden, and the truth about this diabolical basketball creation comes tumbling out into the light now. Whatever they are, they show themselves now. Whatever happens, LeBron James and the Miami Heat own it. Whatever happens, history gets to be the judge now. And this is merely the Eastern Conference finals. They weren't created to hang that banner, but the big one, and that feels far, far away now. And yet somehow, some way, they have to stop fighting the weight of this burden and embrace the entirety of this experiment. One more loss, and Armageddon awaits for this franchise and its stars. One more loss, and the wall could come tumbling down on LeBron James, these Heat and a world that may see a modern basketball superpower dismantled before everyone's eyes.